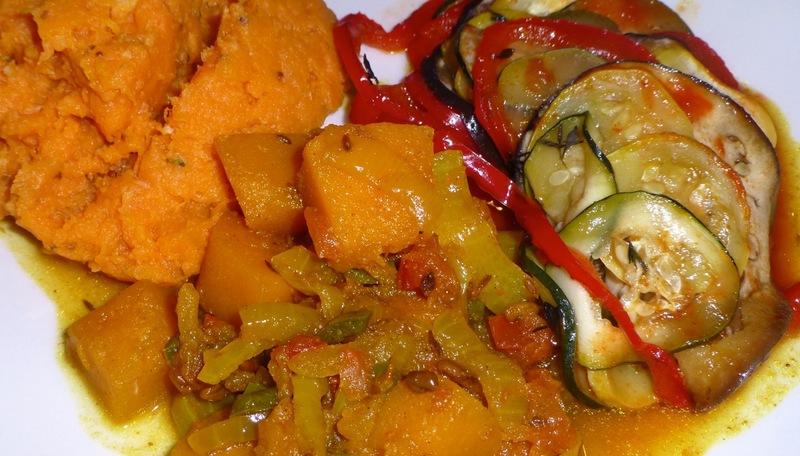 Tonight we had a paleo vegetarian meal that included Ratatouille, Indian Spiced Butternut Squash and Sweet Potato Mash. The ratatouille was pretty good but a little soggy although I’m told that’s how it’s supposed to be. I enjoyed (again) the sweet potato mash but didn’t enjoy the Indian Spiced Butternut Squash as much as my husband did. I rated it a 3 on a scale of 5 (with 5 being the best) and my husband thought it was a 5. Go figure. For me, it had a tad bit too much lemon and cardamon seeds (only 2 pods though). Had the butternut squash been spiced down just a bit I would have enjoyed it a lot more. But it really depends on the person and how spicy they like their food, eh?